We are happy to see the mobile movement growing all around the world and we are excited to attend different meetups on this topic. TiMo represents the community of Mobile Developers active in the region of Timisoara, one of the counties of Romania. They held a monthly meeting to present the latests and hottest topics in the Mobile Development field. 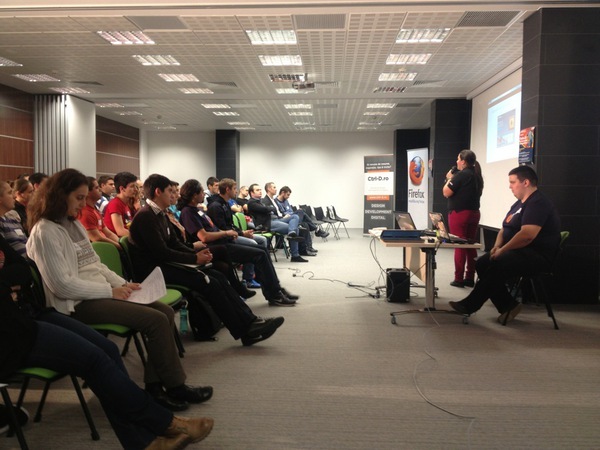 At the latest meetup from this Monday, November 26th was held a Firefox OS presentation and demo. Ioana Chiorean presented the story behind Mozilla, what we made and where we are heading now. The spotlight was centred on our community and how we answer to no one but it. You can parse her slides on her github account. Alex Lakatos talk was a deeper point into Firefox OS by exemplifying the components, the details about what the hardware specifications are and the process of it’s development. You can check his slides too. In the last part of this session, Paul Comanici showed how easy is to create apps for Firefox OS and how portable they are for all web platforms (desktop, providers, etc). We created an isle battle app playing a little also with the r2d2b2g simulator to. The audience (aprox. 150 persons ) was curious about all details presented and played a little with a demo phone. We was pleased to see that Firefox OS was warmly welcomed and the mobile community is already waiting for it’s release.